What Les Halles is the Recipes to Rival challenge of the month? It's Anthony Bourdain's version of coq au vin. He describes this dish as "an old, tough bird that you have to drown in wine to get to taste good." Unfortunately, there's more to it than that. There are several disparate steps to this recipe. There is, of course, the braising of the chicken, but the completed dish is enhanced by separate preparations of onions and mushrooms that require special care. The end product can be quite lovely. My problem? My culinary skills, whatever they are, were honed in the 70's and early 80's of the last century. That means I've made a lot of coq au vin and have some very firm opinions as to how it should be prepared. The hard part was keeping my changes to a minimum and preparing the recipe as it was written. I think I did fairly well. Change number one; the recipe called for a stewing hen. Local butchers laughed at me, so I used a 3-1/2 pound free range chicken. Change number two; I substituted a good shiraz for the burgundy wine that's normally used because I prefer to drink shiraz. Change number three; I added a quantity of thick (almost jelly-like) chicken stock to cover the chicken as it braised. Change number four; I increased the amount of bacon used in the recipe to 6-ounces, but blanched the lardons before adding them to the pot. Change number five; I used thawed, frozen pearl onions instead of fresh. My family can deftly move onions from one side of the plate to another before burying them under chicken bones, so the onions are just for show and I refuse to kill myself preparing them. Change number six; I added 1 tablespoon of tomato paste to kill the purple color of the wine that caused the chicken to look black and blue. I also reduce the sauce by half before napping the chicken and vegetables. Technically, when a young chicken is used to replace the stewing hen the dish should be called braised chicken, not coq au vin. I'll never forget how the use of a young bird offended Andre Soltner when he judged a Top Chef episode. 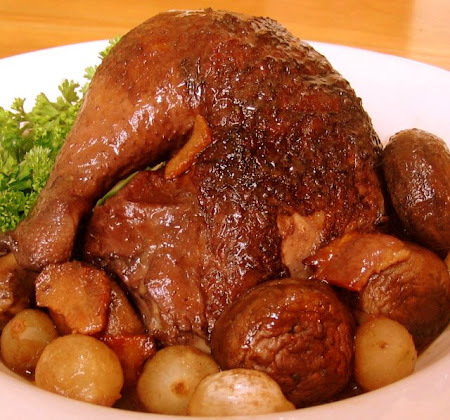 If you have time and would like to prepare coq au vin in the classical manner, you'll love this recipe. It is delicious, but it does take time that includes a 24 hour marination. My changes can be identified by red print. The original recipe can be found at Recipes to Rival. This months challenge is being hosted by founders Temperance of High on the Hog and Lori of Lipsmacking Goodness. 1) The day before beginning to cook, combine the bottle of red wine, the diced onion, sliced carrots, celery, cloves, peppercorns, and bouquet garni in a large deep bowl. Add the chicken and submerge it in the liquid so that all of it is covered. Cover the bowl with plastic wrap and refrigerate overnight. 2) Preheat oven to 325 degrees F. Remove the chicken from the marinade and pat it dry. Put it aside. Strain the marinade through the fine strainer, reserving the liquids and solids separately. Season the chicken with salt and pepper inside and out. In the large Dutch oven, heat the oil and 2 tablespoons of the butter until almost smoking, and then sear the chicken, turning it with the tongs to evenly brown it. Once browned, it should be removed from the pot and set it aside again. Add the reserved onions, celery, and carrot to the pot and cook over medium-high heat, stirring occasionally, until they are soft and golden brown, about 10 minutes. Sprinkle the flour over the vegetables and mix well with the wooden spoon so that the vegetables are coated. Now stir in the reserved strained marinade. Stir in tomato paste. Put the chicken back in the pot, along with the bouquet garni. Add thick chicken broth to cover chicken. Bring to a simmer; cover pot and bake for 1 hour and ten minutes. 3) While chicken braises in oven, cook the bacon lardons in the small sauté pan over medium heat until golden brown. Remove the bacon from the pan and drain it on paper towels, making sure to keep about 1 tablespoon/14 g of fat in the pan. Saute the mushroom tops in the bacon fat until golden brown. Set them aside. Now, in the small saucepan, combine the pearl onions, the pinch of sugar, a pinch of salt, and 2tablespoons/28 g of butter. Add just enough water to just cover the onions; then cover the pan with the parchment paper trimmed to the same size of the pan. Bring to a boil, reduce to a simmer, and cook until the water has evaporated. Keep a close eye on it. Remove the paper cover and continue to cook until the onions are golden brown. Set the onions aside and add the remaining cup/225 ml of red wine along with salt and pepper and reduce over medium-high heat until thick enough to coat the back of the spoon. 4) When the chicken is cooked through – meaning tender, the juice from the thigh running clear when pricked – carefully remove from the liquid, cut into quarters, and arrange on the deep serving platter. Strain the cooking liquid (again). Return to a pan and cook until sauce is thick enough to coat a spoon. Add reduced red wine. Add the bacon, mushrooms, and pearl onions, adjust the seasoning with salt and pepper, and swirl in the remaining 2 tablespoons/28 g of butter. Pour sauce over the chicken. Yield: 4 servings. Ooooh... I HAVE to add you in my blog list so I can come back here everyday. Such a delight! Wow! Your picture is beautiful! LOL about the stew hen; I don't think we'd be able to find one either. Changes or not, it still sounds delicious! A favorite of ours and the first time I made it I was very young and thought I was oh, so sophisticated making this dish. We've never had a tired old tough rooster but I do try to get the biggest chicken at the market. We love shiraz as well and IMO the vin for the coq is whatever wine appeals to me at that moment! Mary- you did such an amazing job. And who knew that having an old bird was SO important. I did not. Mary, this recipe is a keeper. I made Coq au Vin when we were first married and took me forever! Always search for new recipes. Thanks so much for coming to grannymountain today and commenting, living in a small town has it's perks! Have a great weekend...joy c.
Wow! Your coq au vin looks awesome. Pinkstripes, I'm so glad you found us. I hope you'll come often. 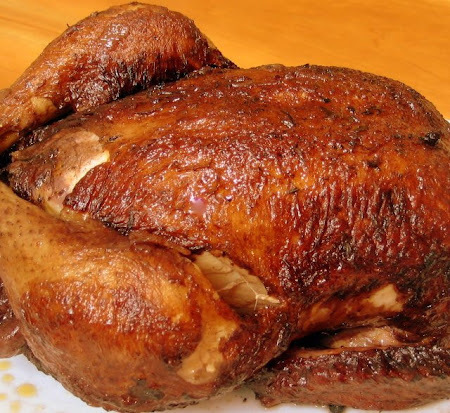 That's one beautiful, golden roasted chicken! I'm so hungry right now that I wish I could reach through the screen and grab it! I'm glad I discovered your blog. You have great recipes. Gosh-it looks so finger-licking good!! Helene, we, too, are glad you found us. I hope you'll visit often. Beautiful pictures as usual. I sometimes crave that wonderful farm raised stewing hen flavor. I've always wanted to try this recipe. I love Anthony so I am sure this is a winner. Excellent photo. Mary, that looks amazing. It puts my attempt to shame! Sara, I saw your entry and your coq au vin is just beautiful. This is a really hard dish to photograph. You have some amazing recipes here. Now that my kids are finally out of the "picky" stage, I can cook 'real' recipes like these again. Pam, I'm glad you found some recipes that are to your liking. I hope you'll visit with us often. Ha! Married to a Frenchman and I have never made coq au vin. The only time I think I ate it (besides high school French club), it was made by an English woman in Italy! This looks and sounds divine! This sounds terrific Mary. Ultimate comfort food.. Wish I had some right now for this rainy chilly day! I am like you I agree with all of your changes. Looks like a winner dinner. Your bird has such great colour! And hurray for frozen pearl onions - who has the patience or the dexterity to peel them? Hi Mary. I couldn't wait to stop by to see what you've been up to before I took off for the weekend. Your pictures are beautiful, and I am jealous you can cook a chicken. I've tried and tried again and the dang thing ends up raw every time. My family runs in fear when I come home with one! And my favorite little piece in your post "I added 1 tablespoon of tomato paste to kill the purple color of the wine that caused the chicken to look black and blue." so true that everyone has a story. Teresa, I'm so glad you found us. I hope you'll visit with us often. Beautiful photos, Mary! I've only made Ina's coq au vin and liked it real well. I bought little pearl onions one year for Thanksgiving and by the time I was finished with them I said 'never again' so I can appreciate the use of frozen pearl onions! Hi Mary! Thanks for stopping by my page on OW. Sorry I am just getting by. Been a rough week. Where have you been hiding? I love your blog. I love reading new recipes. I must follow you! Patti, I'm so glad you stopped by. You and John are both in my prayers. Hi Mary....happy weekend to you. Hey? I have an award for you today on my Sunday blog. Come on over. I am loving his Les Halles book. I cook almost all of the dish from this book, including believe it or not, the fries. This the only dish I haven't tried just because I really want to use a coq. I'll be making this when I am on vacation to Bali, since it is widely available there compare to here in the U.S.
Oh my, yours is the best looking photo of this dish I've come across so far! JMom, first a welcome and then a thank you for your kind words. I hope you'll visit often. your chicken looks Lovely! I will have to use some tomato paste next time, the black and blue look really isn't that appetizing. I will have to try your version to see that differance. I results certainly look Fantastic!